Revelation continue to do good service in issuing recordings from the Russian state radio archives. I wish they had spent more time on the rarer or unusual material like this than on 'great performances' though I can appreciate that "sensible" commercial considerations might seem to preclude this. That's a pity with such attractive and occasionally compelling works as these. If you read Gramophone's excellent feature on the USSR symphony of the twentieth century you will need no beckoning from me to get these discs. Boiko - Leningrad-born. Clearly in thrall to Tchaikovsky - heard "through a prism" in his music. Bunin - Pre-1948 pupil of Shostakovich and it shows. Gabichvadze - Georgian whose music reflects Berg and Bartok as well as his homeland's native music. Parsadanian - An Armenian who moved to Estonia and studied with Heino Eller but whose 2nd symphony is determinedly Shostakovichian. Melikov - Azerbaijani who studied under fellow Azerbaijani, Karayev (himself a Shostakovich pupil) and whose second symphony is dedicated to Shostakovich. The first volume in this series was devoted to violin concertos and has already been reviewed. These two CDs (only available separately) have conducting duties shared between Evgeny Svetlanov (who clearly relishes the Boiko) and Gennadi Rozhdestvensky. The orchestras are various brands of State Symphony Orchestra. The recordings (not identified as mono or stereo) span 1968-1989. The earliest is the Parsadanian; the latest, Gabichvadze. John Kehoe's notes are as usual fine and informative although I would have liked a few signposts to other works by these composers and there is space on the leaflet. This might have whetted our appetites for later volumes. A number of companies have gone in for material of this type. Olympia has done much for many Russian composers and was early in the field if we ignore EMI-Melodiya. Now we have Russian Disc (about which I had heard worrying rumours) and Melodiya itself. In any event these two Revelations currently have the field to themselves. Boiko Symphony No 2 (1978) This is a gem and the outstanding discovery of these discs. If Bunin is a Shostakovich acolyte and Gabichvadze leans on a mix of Bartok and the exotic, this work by Boiko is deeply romantic. It could easily have been written by Tchaikovsky had he lived a double life-time. There are also elements of Rachmaninov in the mix. Svetlanov gives it a performance to match the high romance references I have mentioned. This is very accessible stuff and not a straight shadow of Tchaik and Rach. Boiko is perhaps the counterpart of George Lloyd in Russia. He can wear his heart on his sleeve without shame and with conviction. This is the second of three Boiko symphonies. I would like very much to hear the others and any other orchestral works of his. What else is available? 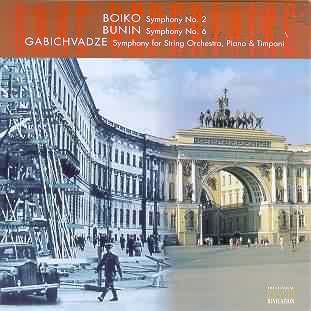 Bunin Symphony No 6 (1966). Bunin was a Shostakovich pupil in thrall to his teacher's style. This comes over quite powerfully. There are nine Bunin symphonies. It would be interesting to know what people make of the other symphonies. The first movement of No. 6 is very busy and at times commanding. The second piacevole movement is a strange confection. A wailing saxophone, snarling brass and a boiling climax all seem distinctly unpeaceful. Disquiet haunts this movement like a grinning skull. There is more disquiet here than calm. The third movement allegro molto skitters and scurries with much colour. Bunin produces some startling textural variety. The tinkling and clicking of this movement recalls Shostakovich 15 but predates it. The final adagio is a wonderful conception - exotic and passionate, pushed forward by a heart-beat. A great brass chorale rears up noble and sad and again that saxophone sings discreetly. Heart-beat and clock-ticking wind in and out of each other. The piece ends quietly - rather inconclusively. It is interesting to note that Bunin was criticised for formalism in 1948 at the same time as his teacher. Bunin then lost his teaching post. He then experimented with serialism but this is not to the fore in this symphony. Bunin is the only composer of the five who is no longer alive. Gabichvadze Symphony for strings, piano and timpani (1963) The first (of five) movement is tense and sombre in a nocturnal Bartokian idiom relieved by at least one tender melody on the solo violin. The second movement is sabre-sharp and fleet of foot in a Shostakovichian way. Lyrical ideas which dance out of this cutting whirlwind are more reminiscent of Prokofiev. The solo piano can be heard in movements 2 and 5 rather distantly in this recording. There is then a pivotal and ardently romantic 6 minute adagio which is almost Hollywoodian in a Herrmann way. This is followed by two brightly effective miniatures lasting no more than five minutes together. While rich in incident I am far from sure about this as a symphony - more a suite than anything else. Gabichvadze broke new ground in Georgian music with this symphony but for all of its Bergian credentials it does not forget the innate lyricism of the republic. Gabichvadze was entirely a product of the Tbilisi conservatory. Parsadanian Symphony No 2 Martinos Sarian (1968) The Sarian of the title is an Armenian painter. The symphony's connection with the painter is not described in John Kehoe's notes. This is a big work in every sense, running close to 45 mins; epic, sorrowing and passionate both in loving and in conflict. The language is very strongly coloured by Shostakovich's palette. Parsadanian was an Armenian who became an important figure in Estonia. This makes for an interesting complement to the position of the Estonian symphonist Eduard Tubin who became a world figure only after moving to Sweden. Parsadanian's symphony is conducted by the always reliable Svetlanov whose reputation increases for me every time I hear a new recording of his, especially in the rarer repertoire. Not once do you think that his performances are time-serving. From the commanding opening maestoso first movement with its strong brass figure, to the gentler intermezzo, the long-breathed Lento and the intense and finally meditative finale (strangely it is marked allegro con fuoco) you are never in doubt of Parsadanian's serious intentions or his gifts. Melikov Symphony No 2 (1971?) This is dedicated to Shostakovich. It is not however, a clone Dmitri-symphony. It is in six movements. The ideas are often atonal and any sense of nationality is absent. The music is written in the universal colouring box of the avant-garde of the fifties and sixties. The recording is taken from a live or studio performance complete with audience. There is the occasional cough but nothing too disturbing. No applause - nor is there on either of the two discs. When a friend mentioned that this repertoire had been previously issued (can anyone provide details?) I wondered about the provenance of the recordings. Are they from Russian radio archives? Whatever their background the present CDs are treasurable and unusual. Their cost is modest (at least in the UK) and the works belong in any collection of 20th century symphonic music. The Parsadanian and Boiko works are highlights. More please Revelation.